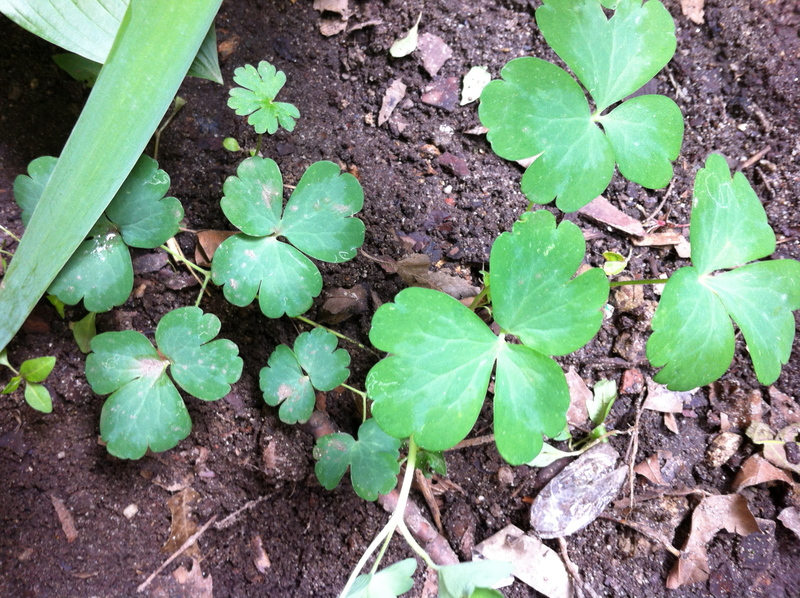 This entry was posted in Mystery Plants, Weeds and tagged Aquilegia, Columbine, hardy geranium, mystery plant. Bookmark the permalink. I can see why you might think it’s a geranium, but I’m pretty sure it’s a buttercup. And yes, they can be invasive, spreading by above-ground runners. I have it in my garden and I just rip it out when it gets out of hand, but if you need a good groundcover, it will do so pretty quickly! They have yellow flowers eventually. I agree, the second one is almost certainly Columbine. The first one does indeed look like the family of hardy perennial Geraniums. I have also grown the buttercups. The growth habit in your photo does not quite match what I have grown as Ranunculus acris ‘Flora Pleno’, the rampant buttercups. The foliage is close to that of the buttercups, but its habit is usually more open and running, less of a clumping mass. I view it as a hopping skipper across the top of the soil, rooting as it jumps. Maybe it depends on the site. Or maybe it’s a slightly different type of buttercup. If you get a bright yellow flower on a thin stem, it’s probably buttercups. They can be invasive if not hemmed in well. Usually easy to pull out, though. 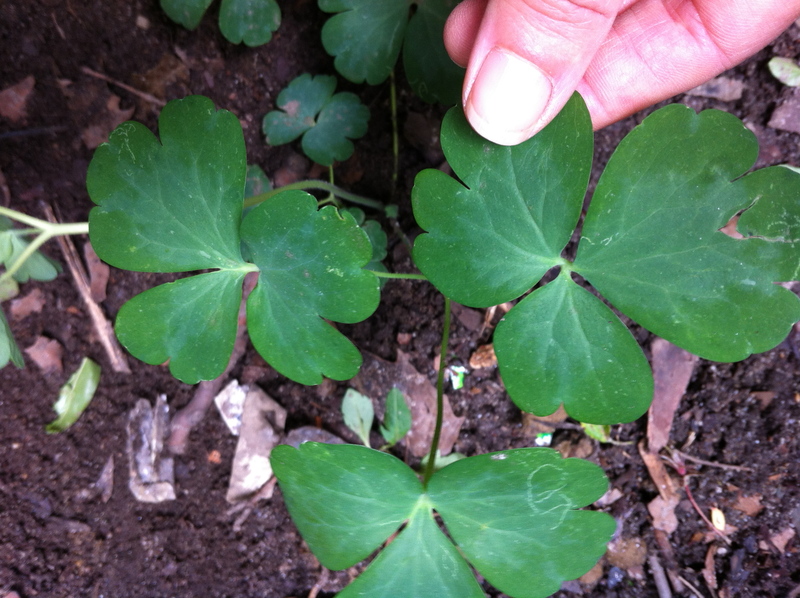 As for the mystery plant, I am so curious now to see if it is in fact buttercup! 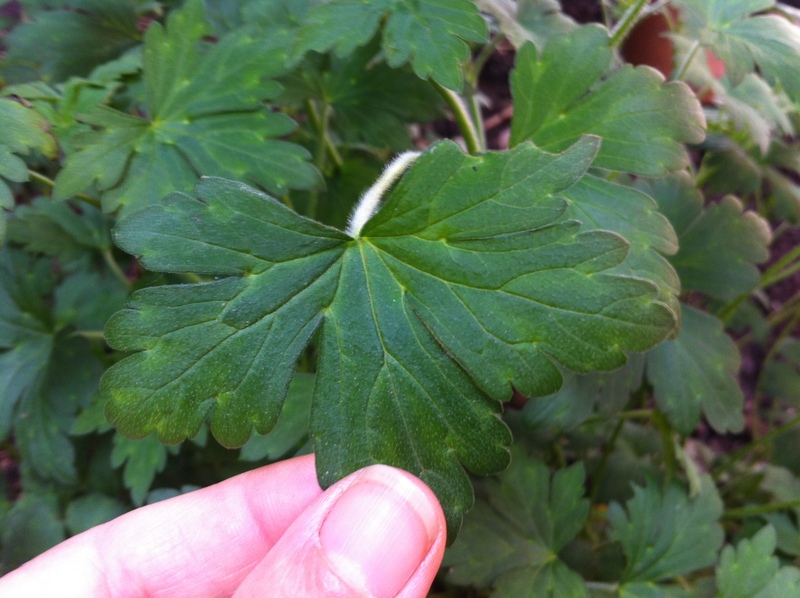 The leaves look incredibly similar to hardy geranium. I took one of the little baby plants that I ripped out and compared it to what I KNOW is a hardy geranium…different growth habits! 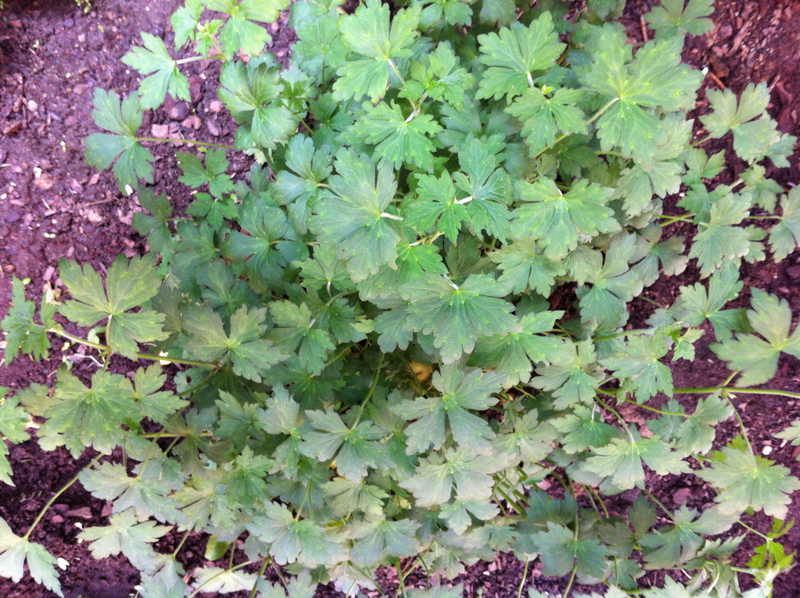 My hardy geranium seems to grow lower to the ground in more of a mound. This *buttercup* is taller and lankier, even though it does grow in a clump. Not really bad to look at so far, but if it’s this aggressive it might have to hit the road. It’s a very unique shape. I placed some of its seeds into the winter jugs in addition to tossing them around. I have a good handful of fresh seedlings. I am also hoping the original plant will rebloom this summer, but it’s not putting out any stalks yet. The seeds came from my sister in law in Bloomsburg, PA. Her whole color scheme is blue, pink and white, all around her farmhouse. Ahhh…great photo on May Dreams Gardens – I can’t wait for these! Hopefully I’ll be able to save some seeds and have more next year too. It’s an amazing paragraph in support of all the online viewers; they will obtain advantage from it I am sure. It looks like hardy geranium to me..is not aquilegia. The seeded one’s you have marked is. 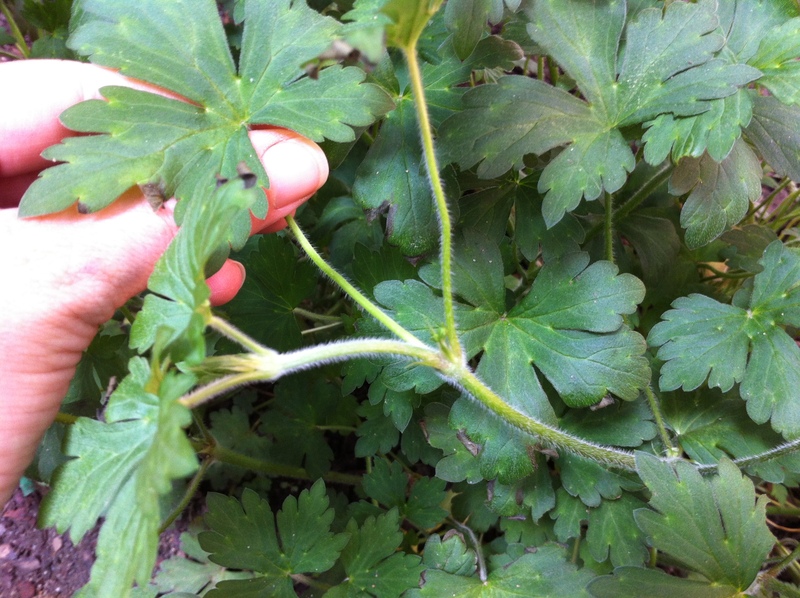 Geranium can readily seed out, so what you probably have are rogue plants. To prevent that, dead head them when they get their spikey seed pods. Hope this was helpful!